July « 2011 « What will I cook today? So one Friday evening, we all got majorly decked out and went to Savore Ristorante, an Italian restaurant in Soho (200 Spring Street). We came for Restaurant Week, for dinner. 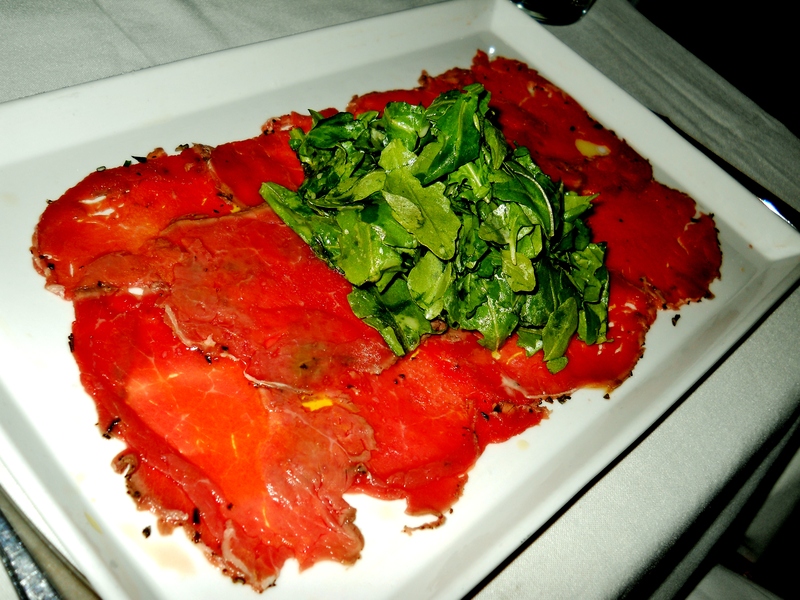 Carpaccio: thinly sliced beef carpaccio with arugula and parmigiano. My friend who got this said it was pretty much amazing and ate the whole plate! I got the Mare, or mixed seafood salad with grapefruit. It was very good but a lot of seafood for one plate… I gave some away. Also, not a fan of green olives but that’s just me. The scallops were really yummy, as well as the shrimp but I did find the squid kind of chewy… which I guess is normal for squid. 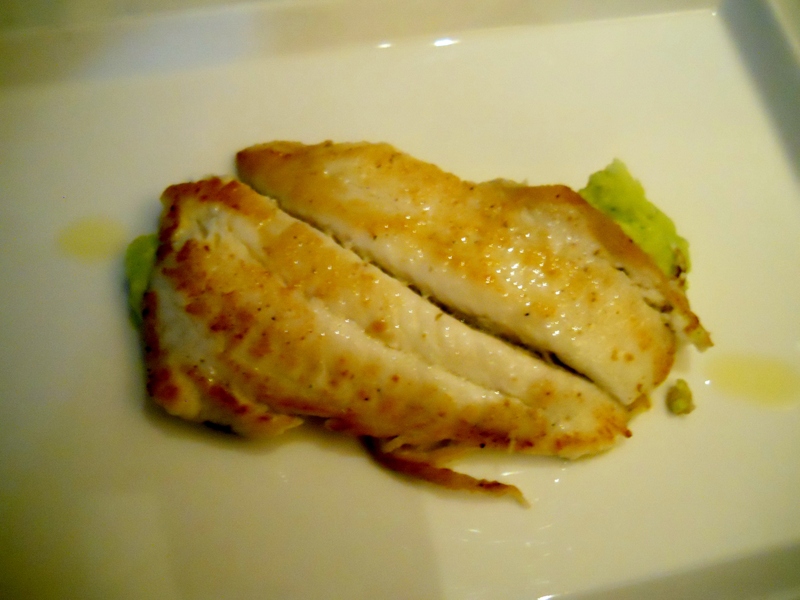 For entree, the Sogliola: grilled filet of sole atop pesto mashed potatoes. The pesto potatoes were SO good even if a little bit heavy on the salty side and will totally be replicated at home. The sole was really light and flavorful, with some delicious crispy parts. 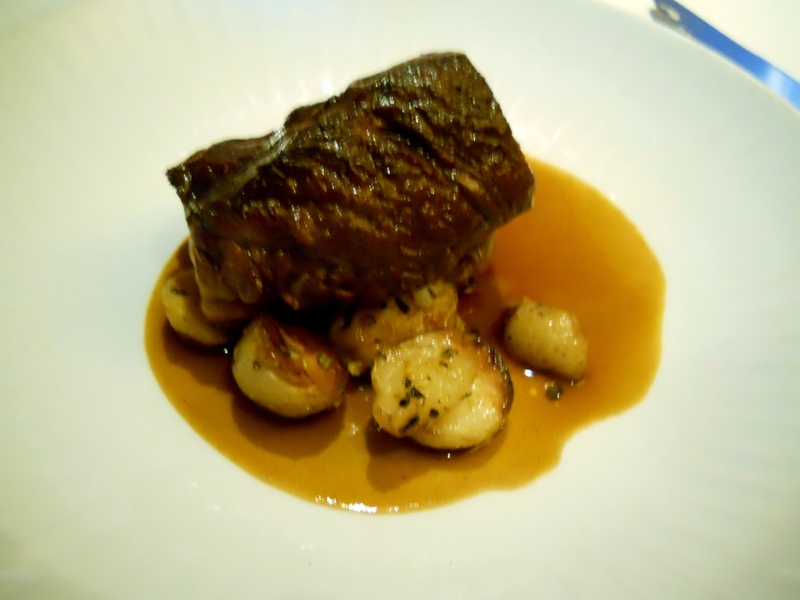 Another entree at the table: Costine – short ribs braised with a Pinot Noir reduction and roasted potatoes. The meat fell right off the bone and definitely hit the spot for those who ordered it. 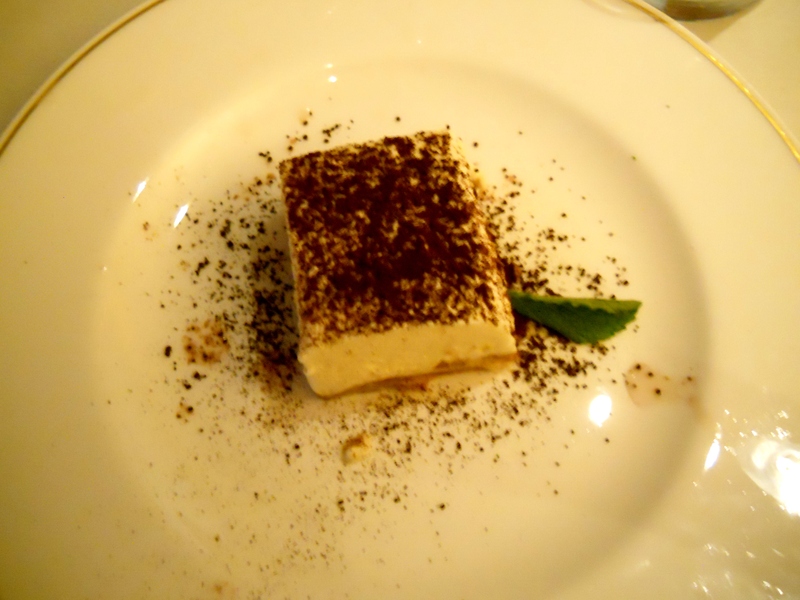 The dessert… just a simple tiramisu… was amazing. The best tiramisu ever. Turned me from tiramisu-disliker to a tiramisu lover. If you have only had bad tiramisu… please do yourself a favor and try this one. Overall, a very nice dinner out. It was nice and relaxing inside, with an authentic Italian feel. The service was very prompt — almost too prompt — but we left full and happy. I don’t know if I would return here (I’m not that big of a fan of Italian dishes) but if I were, I would definitely come back. So I feel like when I cook here in NY a lot of the same ingredients seem to come into play… see my quinoa from before. 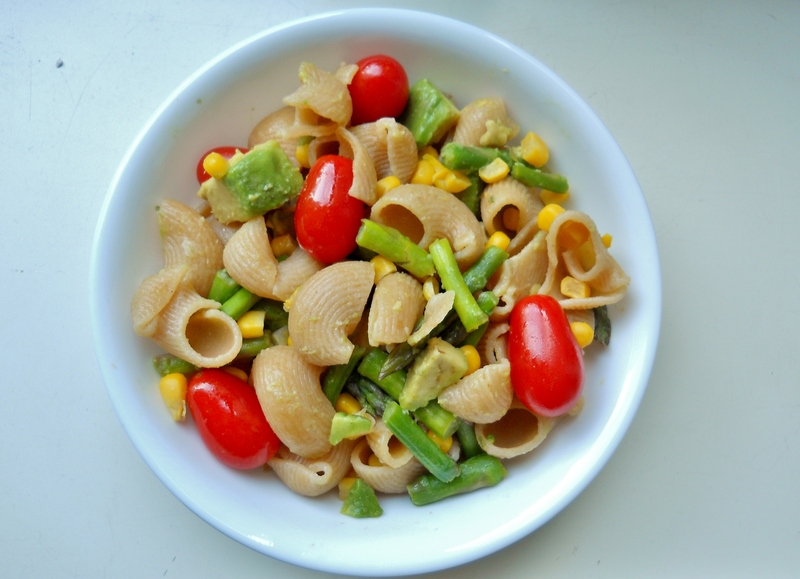 However, two new players are in town: Asparagus and whole wheat pasta! Black beans are out of style. Just kidding. I just couldn’t find any in Food Emporium… the audacity. This was so yummy and so easy to make, even if my tiny apartment pot almost overflowed. Boil pasta until al dente in a large pot. Wash and cut asparagus into bite sized pieces and microwave, covered loosely for 2:30 on high. Rinse off the tomatoes and corn. Whisk the lime juice, zest, and olive oil together. 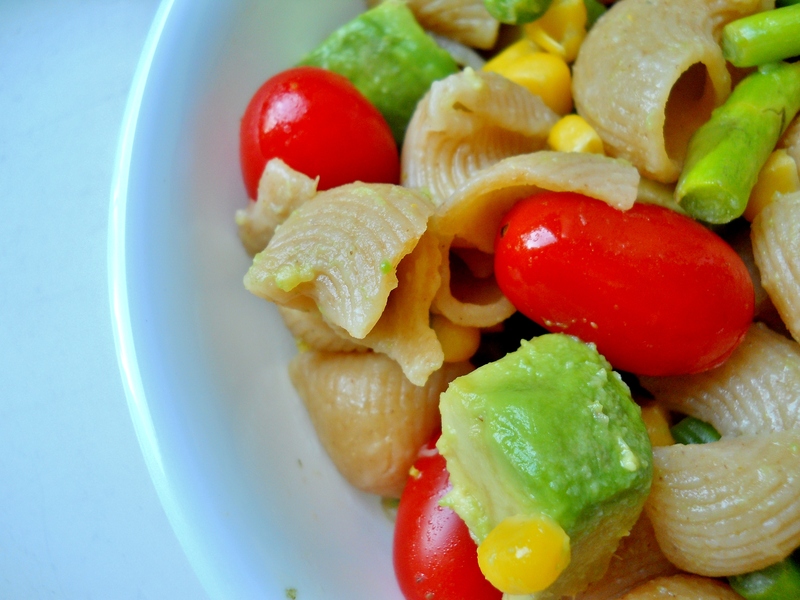 Drain pasta and add everything but lime dressing. Then toss with lime dressing. I’m not sure how avocado does in the microwave but I’m afraid to try, so this is served cold when left over. But it’s still delish. Once again, loving the creamy/crunchy/sweet/tart/citrusy combination. 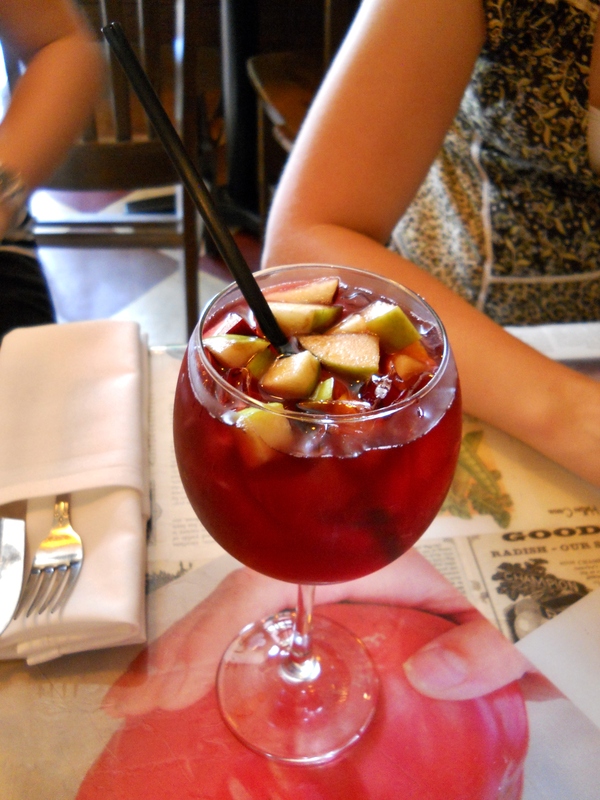 One of my friends ordered the House Sangria. It was pretty tasty… and fun to eat the cubes of apple and orange. Pizzas come in both personal pies and for larger pies for two really hungry people or more less hungry people. 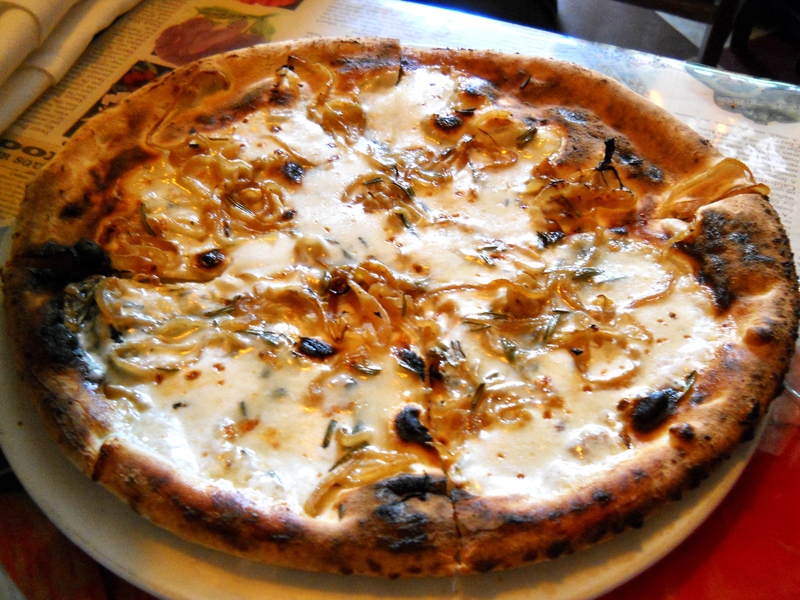 This was a personal pizza, simply called Gorgonzola, which came with mozz, its namesake cheese, caramelized onions, and rosemary. My friend loved the caramelized onions so much she picked them off and ate them; she later ended up eating the rest of the pizza that was now just infused with caramelized-onion flavor. 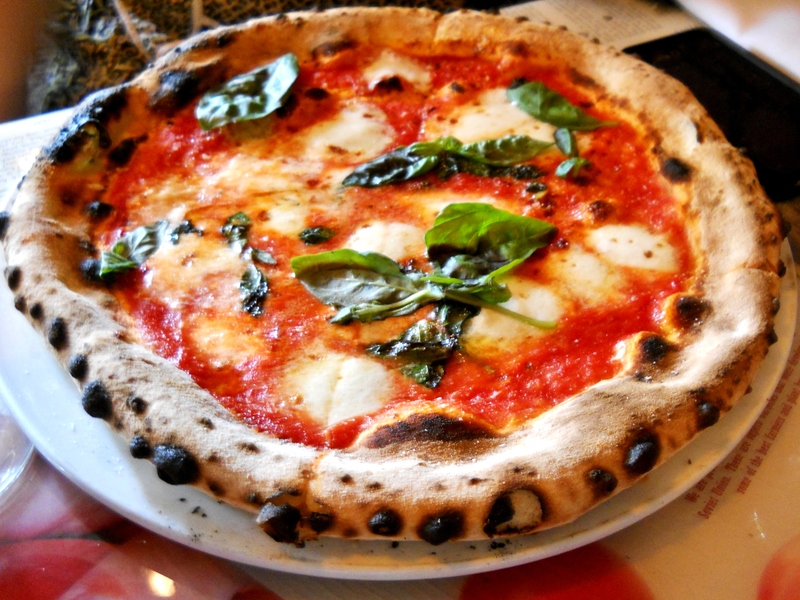 Another personal pizza: Margherita Classica. Tomato, mozz, basil, parmigiano. Perfect for the one in the group who doesn’t like toppings on their pizza. These pizzas were basically devoured, nary a crumb left. So, so good. Let’s just say they were definitely worth the taste test. Price range: somewhat expensive, with personal pizzas running from $8-$14, and larger pizzas $15-$22, depending on the quality of ingredients (not including the special Tartuffo pizza, which comes with mozz, black winter truffle, fontina, ricotta, and olive oil; a large pie runs for $50). The menu also offers some “brick oven specialties” and calzones, plus a wine list. 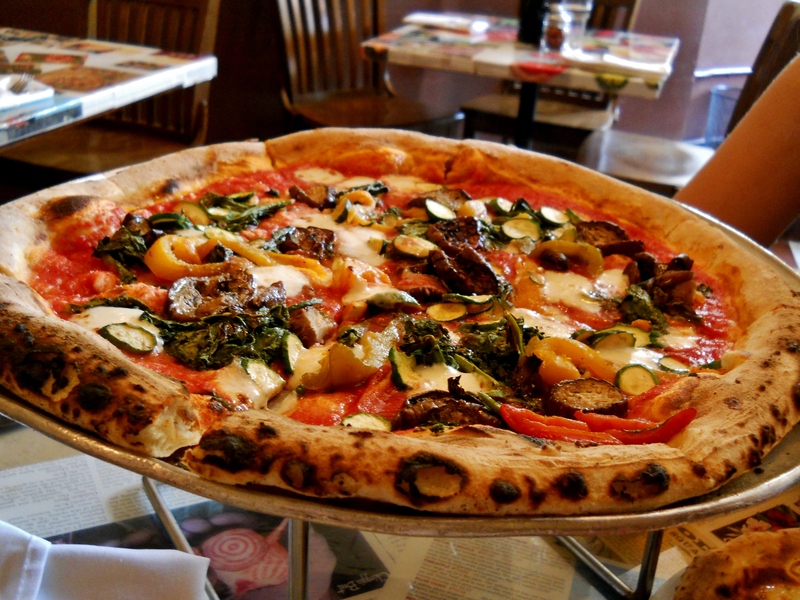 If you are looking for upscale pizza, look no further than Fornino… definitely worth a trip back. Discovering places that consistently serve up outstanding dishes is a lot of fun. 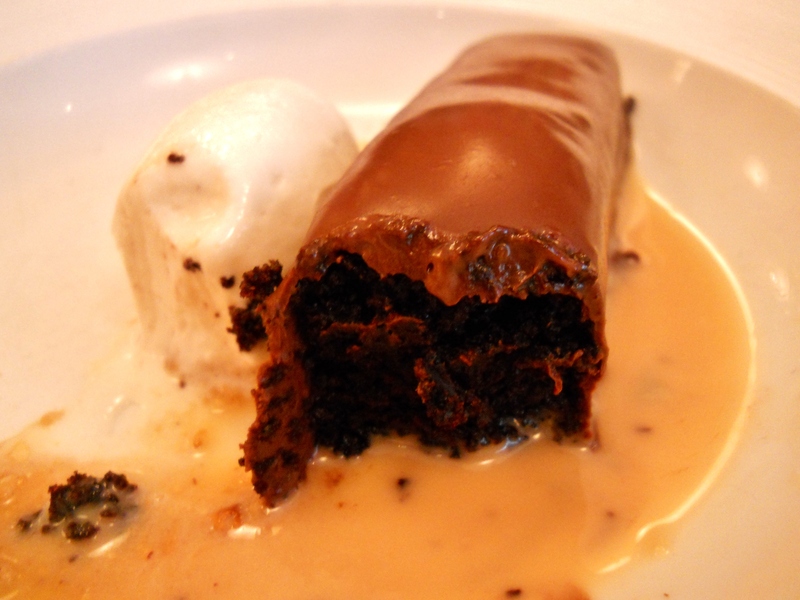 Especially when most of these dishes include chocolate. 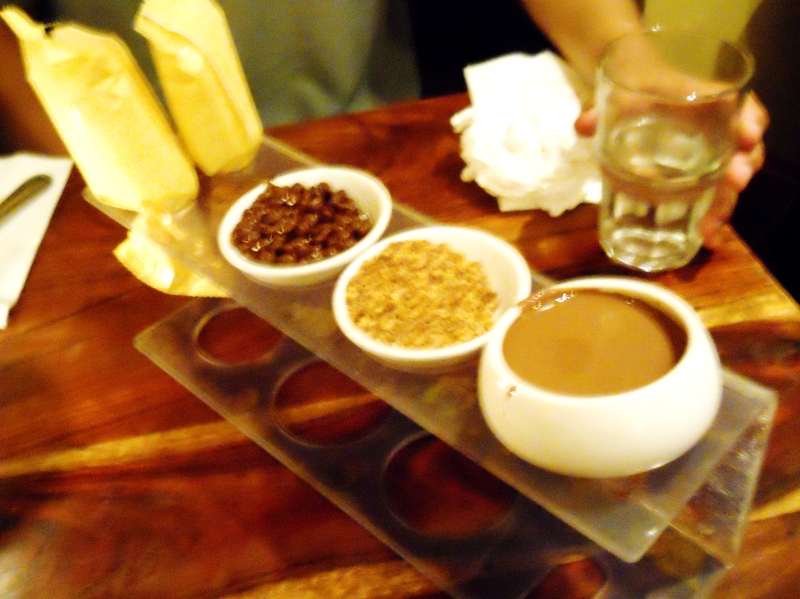 Enter, Max Brenner: Chocolate By the Bald Man (814 Broadway between 13th and 14th, New York City), recommended by my boyfriend. It was as good as he remembered from the last time he had been there, over two years ago. 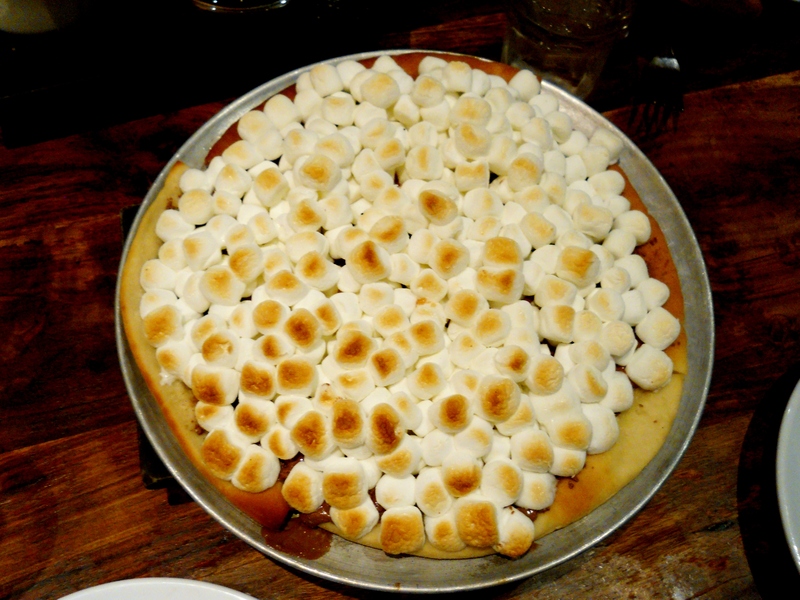 Above: Chocolate Chunk Pizza with white chocolate, milk chocolate, and roasted marshmallows. Oh my goodness. So delicious. One slice will fill you up with the best sugar rush of your life (in a totally good way). 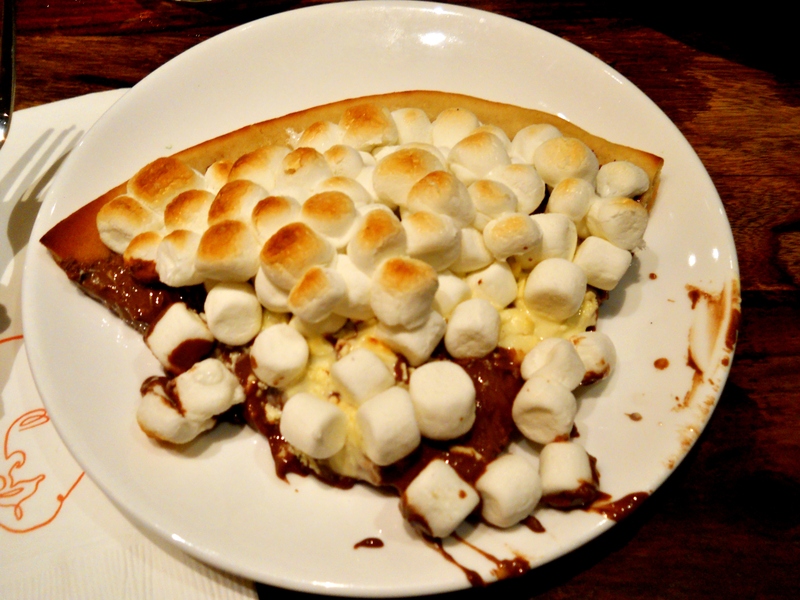 The marshmallows are toasted perfectly, and the chocolate is melty and goes really well with the crust, which is a bit lighter than your usual pizza crust. My friends also got Chocolate Chai Tea (although she couldn’t taste much chocolate) and a Vanilla Milkshake with chocolate sauce (which came in a really cool “drink me” ceramic cup and a metal straw, which could be bad if you tend to bite your straw). On a return trip, we sampled the actual food, since it looked so tantalizing the first time we were here. Luckily it did not disappoint either! Every dish that came and that I saw being served to other tables had such lovely/whimsical presentation. 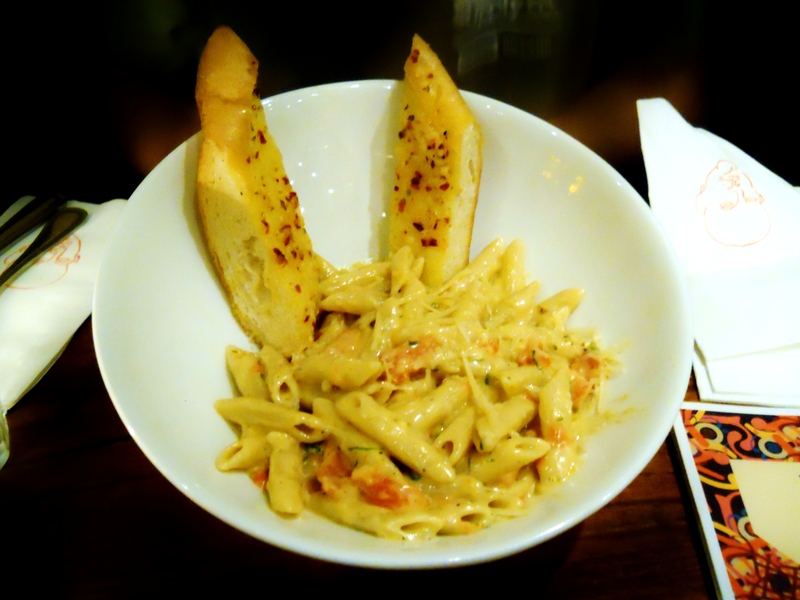 Above: Penne Alfredo with oven roasted tomatoes, parmesan, and garlic bread. Boyfriend absolutely LOVED this dish and is tempted to get it every time we come back. 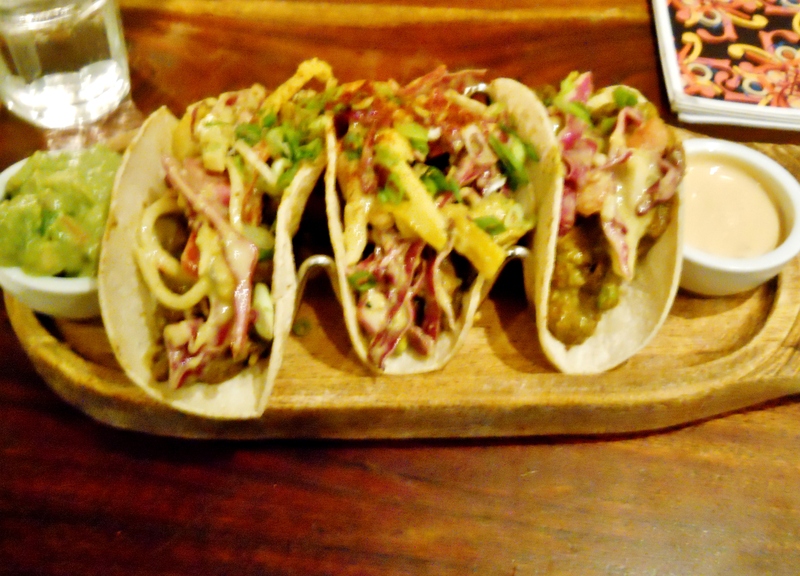 I got the Fish Tacos with guacomole and chipotle sour cream. They also had shredded red cabbage, and lettuce. They were drippy and delicious–and the little metal stand they were served in was very helpful in helping them hold together! For dessert, we got “The Fantastic Popsicle Chocolate Fondue” with “vanilla ice cream popsicles, pure melted chocolate, crunchy wafer balls, candied hazelnut crunchy bits to create your very own and never ending chocolate coating.” Unfortuantely, the description lied because it DID end, and it was most unfortunate!! This dessert was so fun and delicious, not to mention hands-on. After the ice cream was inevitably licked away, we just dipped the Popsicle sticks into the chocolate and ate it straight up or with leftover hazelnuts. It was SO good. This restaurant is definitely a one-of-a-kind experience, and actually won’t leave your wallet too empty! Both times I have been there, the waiters have been very friendly, fast and nice (although one was slightly OCD with utensil placement). Inside is also a chocolate store where one can purchase Max Brenner truffles, a chocolate syringe perfect for ejecting melty chocolate directly into your mouth, among other chocolatey goodies. There is also a chocolate bar with take out options. Although somewhat tight and dark, you feel private yet involved with everything that’s going on; what I mean is, you don’t hear conversations at the other tables but are still situated close enough to drool over/get ideas for the dish you’ll order next time. 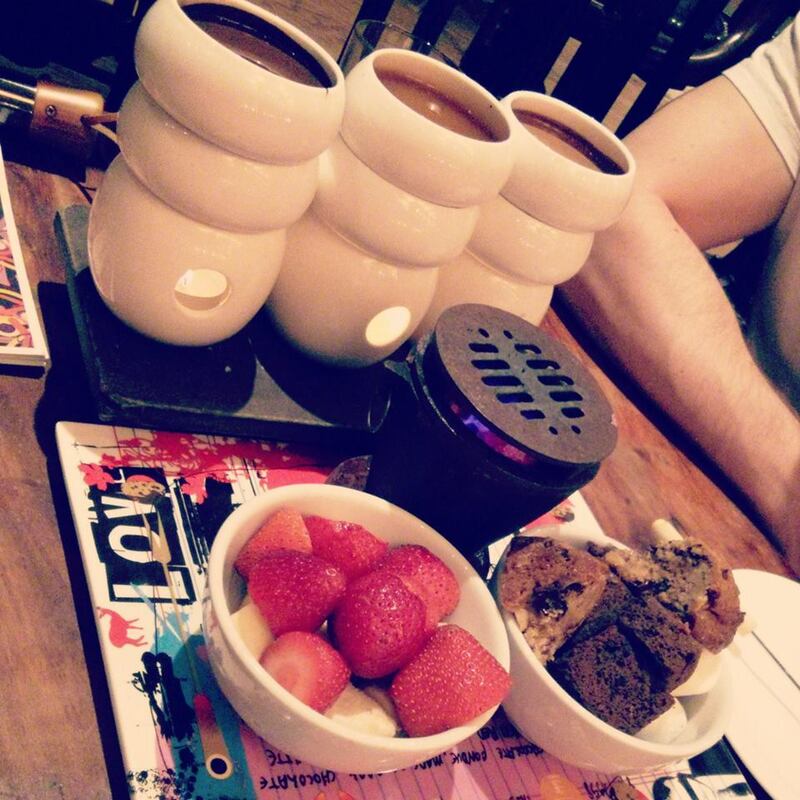 And next time… totally getting the chocolate fondue that comes with a roast-your-own-marshmallows deal. Oh yeah. …After totally forgetting I ever wrote that last sentence two years ago, I found myself at Max Brenner again this summer and what did we order for dessert (after getting the delicious entrees of Veggie Burger, Margherita Panini, and Turkey Club)? … The roasted marshmallow fondue. And it was DELICIOUS. Yes, this was Instagrammed. Aheh. Strawberries and bananas in one bowl, with giant chocolate chip walnut cookie chunks, brownies, and marshmallows in the other… with dark chocolate, toffee, and milk chocolate fondue dipping sauces. My veggie burger was DELICIOUS. 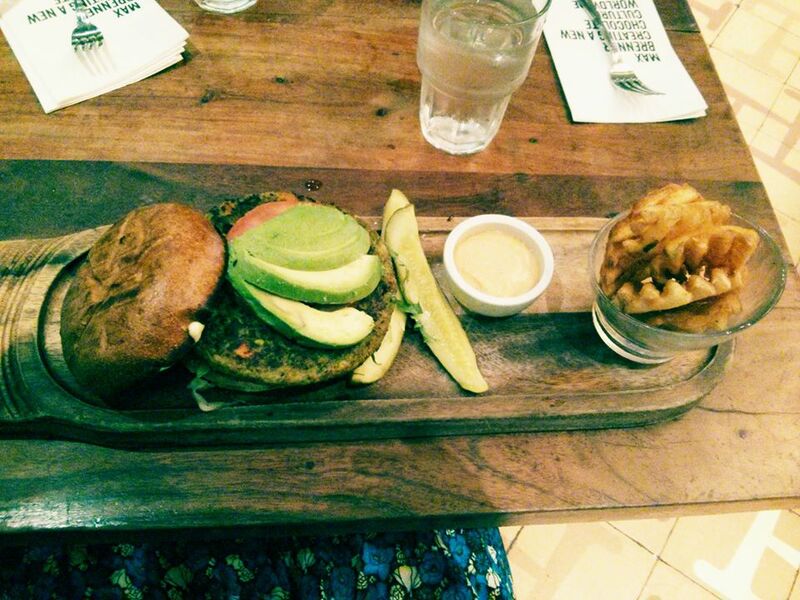 The burger itself was just what i like in a veggie burger–lots of veg, and not some mysterious soy isolate smushed into a patty-formation… and it came with avocado! The bun was deliciously toasted–I usually don’t eat the bun that comes with burgers but couldn’t help myself, it was so good. The fries were waffle fries, dusted in chili and cocoa powder, and were a perfect serving size. This place can do no wrong. 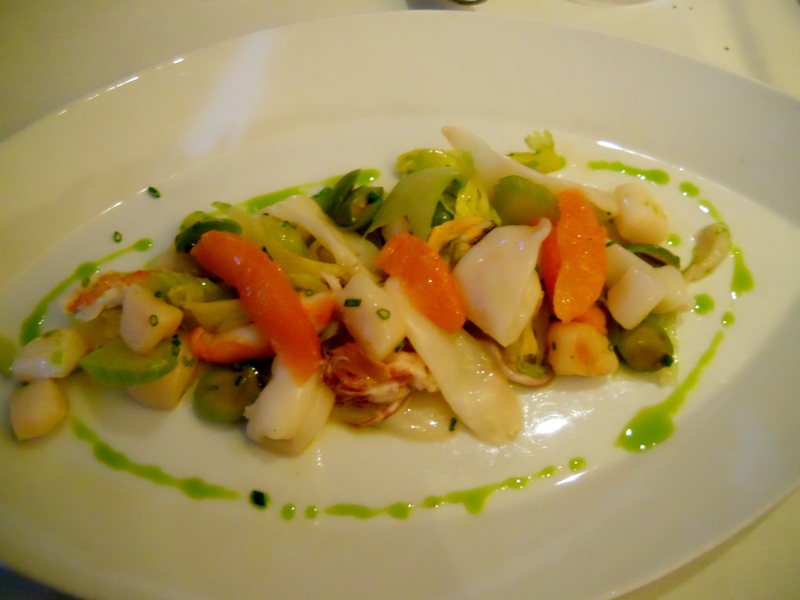 I took an extra-long lunch break and met up with my family for a meal at Fishtail, by David Burke (135 East 62nd Street, NY), a restaurant participating in Restaurant Week. 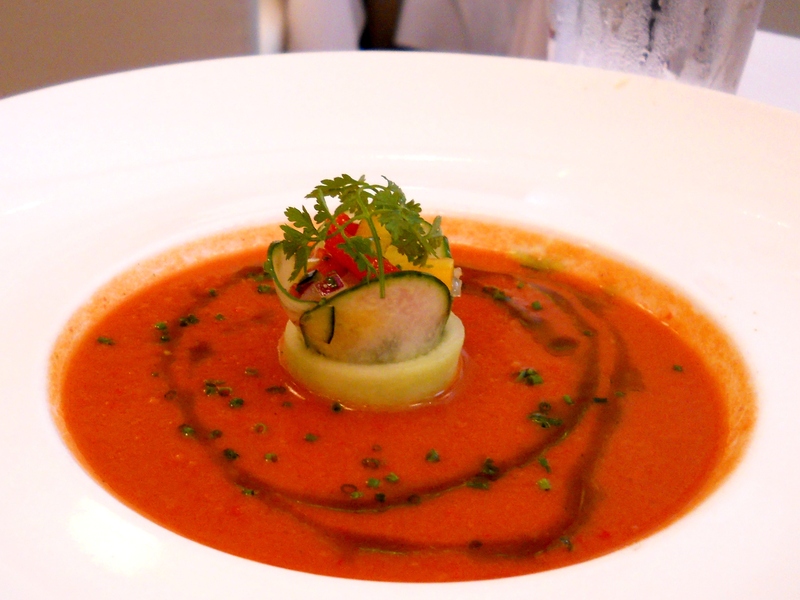 Mom got the Tomato Gazpacho. She said it was really good and the perfect amount of heat. It was gone in almost no time! My brother and I got the Smoked Trout Scramble, served in a giant ostrich egg! 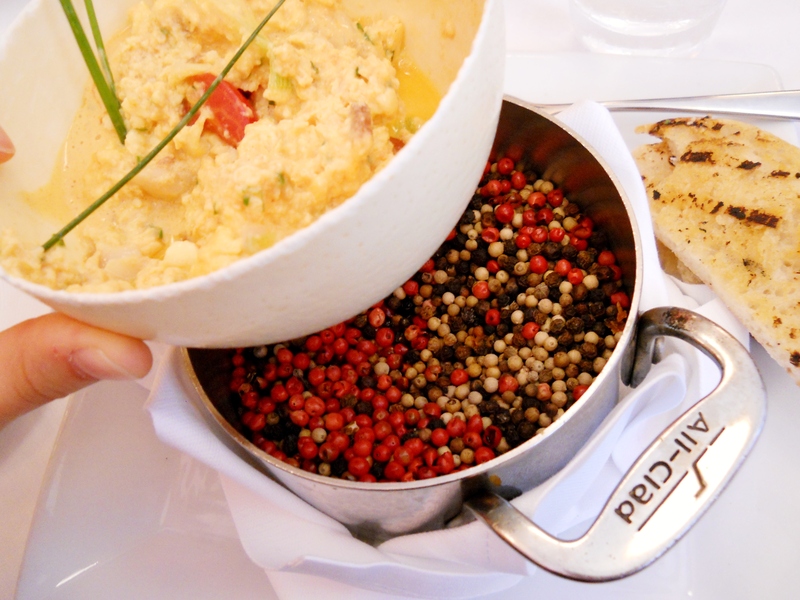 It came with spring onions, roasted red peppers, cherry tomatoes, tomato crème fraiche, smoked trout and the lightest scrambled eggs ever. 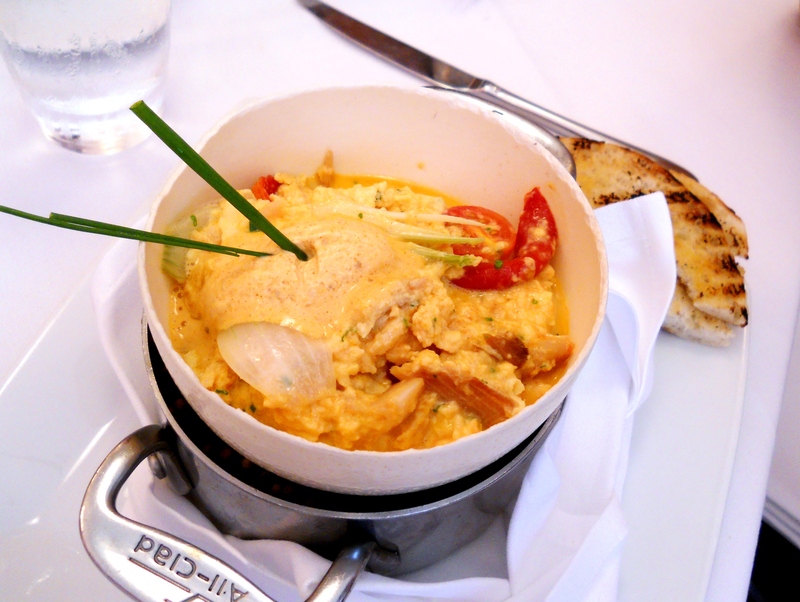 The tomato creme fraiche was so savory and perfect with the eggs, and it was fun to eat out of the thick eggshell. The toasted bread complemented the scramble well. Underneath was a pot of colorful peppercorns! Not sure exactly what the purpose was, but it was pretty cool! 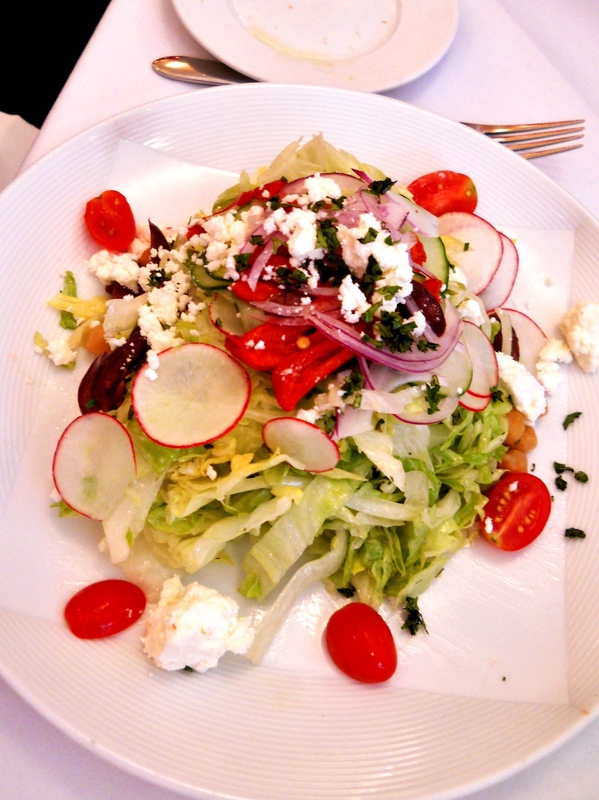 Dad got a chopped salad, with bacon, cucumbers, radishes, halved grape tomatoes, roasted red peppers, hearts of palm, olives and bleu cheese.It looked delicious–the radish and cucumber were cut so thinly–and my dad ate every bite. 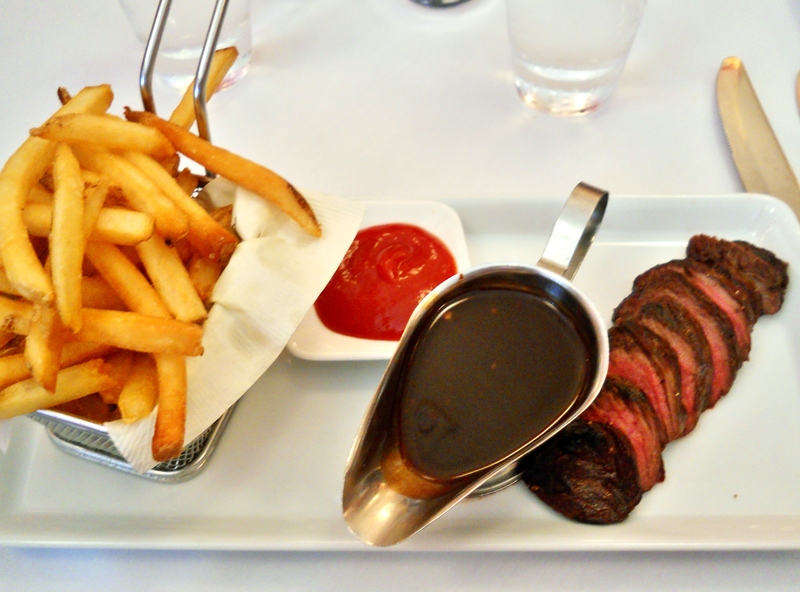 My brother got the Hangar Steak with Steak Frites. After the initial “I hope this is an appetizer” look, he gave it an 8 out of 10. 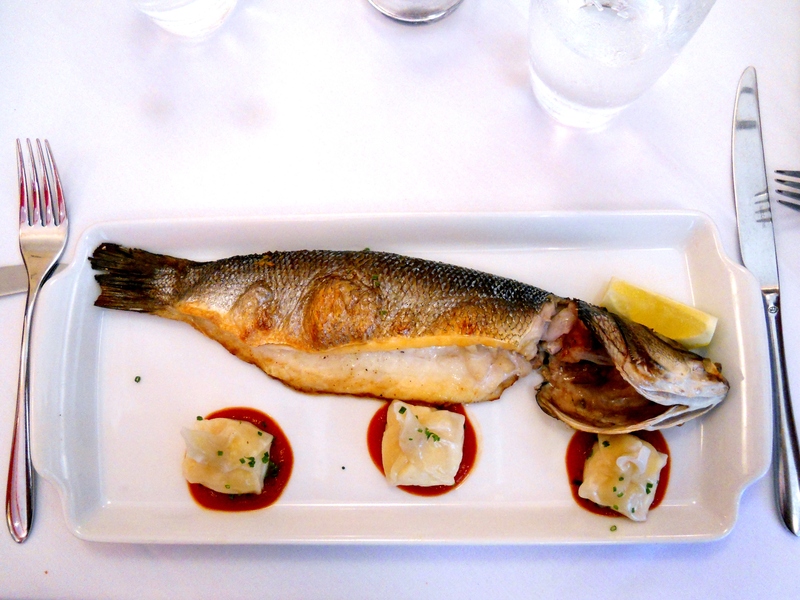 The rest of us got the Whole Roasted Branzino, sea bass, that came with ricotta dumplings and a smoked chili sauce. It was AMAZING. So delicious, melt in your mouth, cooked perfectly. The skin was crispy and the white flesh just … so good. I have never tried sea bass before and I will definitely try it again. However, the ricotta dumplings were less than perfect… kinda dry, not very creamy; of course, that didn’t stop us eating every bit. The sauce tasted like ketchup but complemented the fish and dumplings well. Brother got the Tropical Fruit Sundae with guava sorbet, passion fruit and pineapple. It looked pretty yummy! And a piece of dried pineapple, reminiscent of a fishtail, to top it off. He said he liked it. 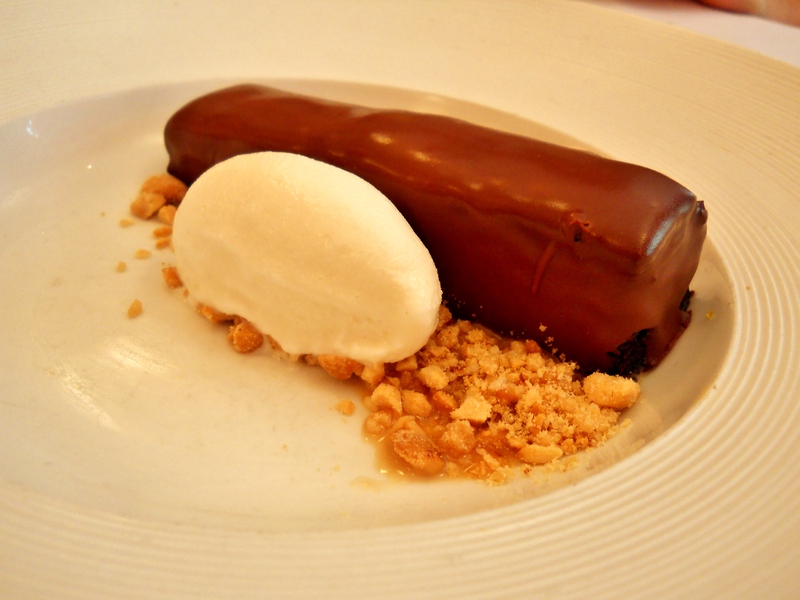 We also ordered the Devil’s Food Cake with salted peanut ice cream and milk jam. Not sure exactly what the deal was with the milk jam… it was just a milky sauce that isn’t visible in this picture. The salted peanut ice cream was amazing though… my taste buds were hit with a strong peanut flavor and of course, salty and sweet are a killer combination. The cake was super chocolatey and dense… I wished the ice cream to cake ratio were more 1 : 1 rather than 1 : 5 but this dessert was phenomenal. The roasted peanuts added yet another level of texture and flavor. There’s the “milk jam.” It was really yummy; I don’t know about you but I love soaking melty ice cream into cake and this was similar to just that. Upon leaving, instead of complimentary mints, there was complimentary peanut brittle… which was perfectly peanutty and not too sweet and hard–so delicious! Fishtail was an awesome choice for Restaurant Week. The atmosphere was fantastic; first you walk in to a bar area, and then climb up the stairs into a brightly colored room with huge windows, letting in lots of natural light. Colorful pictures of fish adorn the walls and big mirrors help make the room look bigger. The waiters were extremely nice, friendly and very prompt. I would totally come back here if I were rich and famous and had lots of money to spend. But if you can make it for Restaurant Week, definitely come! As is traditional after journal club, we once again ventured out, this time onto 2nd Ave, to have some New York Pizza. 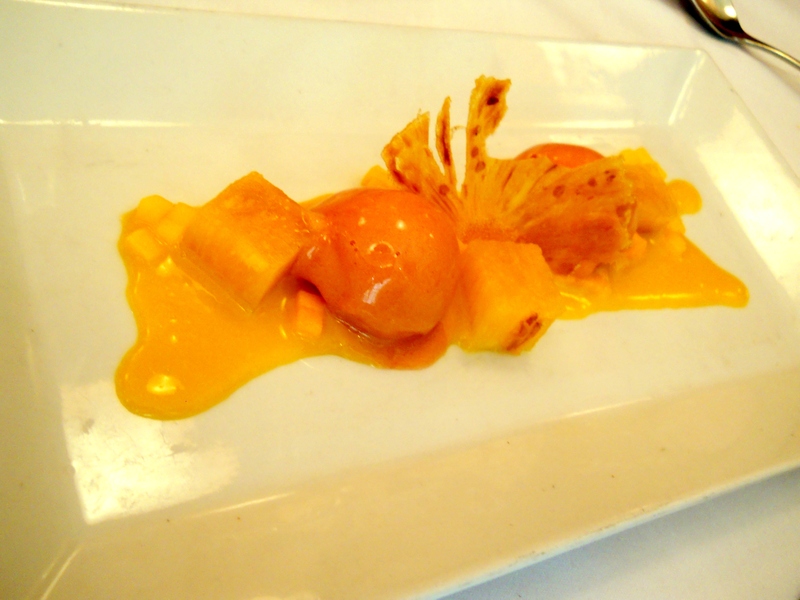 Portofino was our next choice spot (1091 2nd Avenue, New York, NY 10022). 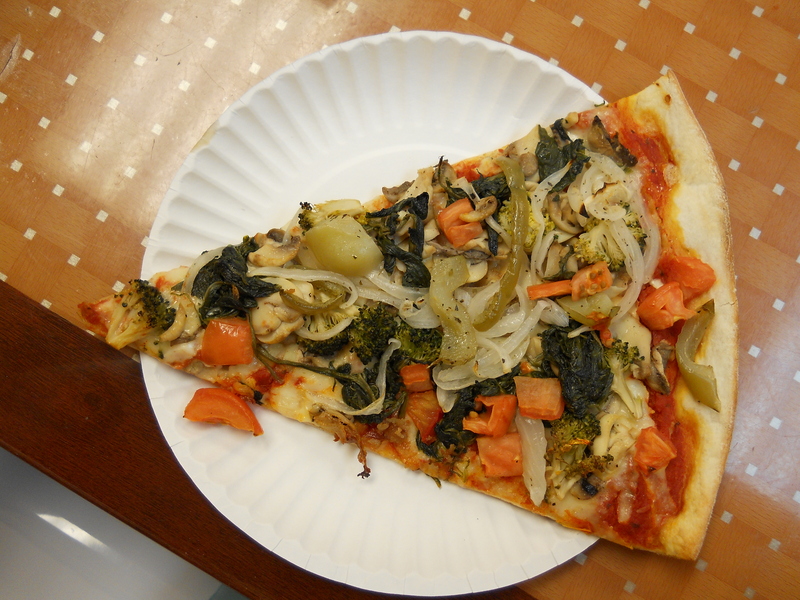 I enjoyed this slice with broccoli, tomato, green peppers, onions, spinach, mushrooms, sauce and cheese. They slices are huge(!) and filled me up considerably. It was yummy! Not out-of-this-world but pretty good. Maybe with some sort of herb or spice it would have been tastier, like some basil leaves or dried oregano. The place itself, atmosphere wise, was okay. We ate first and paid later, which was nice so that we didn’t have to touch money and then eat finger food. The menu also offers a lot more than pizza, such as pasta, burgers, sandwiches, soups, salads, etc. It’s good to know there’s a decent place around but since I want to try lots of different pizza, I have to say that I probably wouldn’t come here again. But it was good for this dinner! I think this slice came out to around $3.50. I saw this exceedingly cute little recipe while surfing the blogosphere and had to make it. 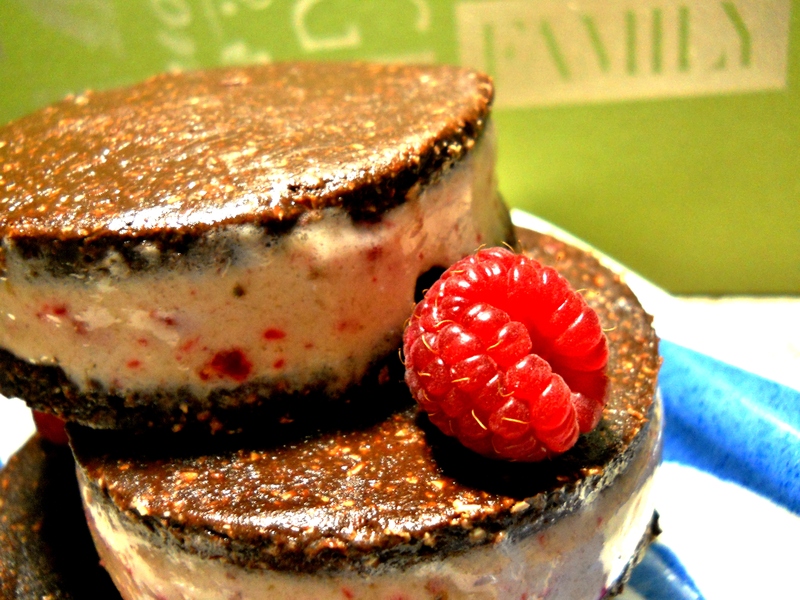 Raspberries in the banana ice cream were inspired by a reader comment. Grind oats in the food processor until a flour-like consistency. Add cocoa, pulse to mix. Pour into a bowl and set aside. Food-process the dates, peanut butter, agave and water until blended. Add the oat flour/cocoa and mix until the dough comes together (it’ll become a huge ball). Lay out a piece of parchment paper, and place the ball of dough on it. Place a piece of plastic wrap over the dough, and roll it out. My cookies were a little too thick, so I would say less than 1/8 of an inch. You want them thick enough to stand up to ice cream, but not too thick to overwhelm, since they are denser than your average cookie. Cookie-cut and then freeze for at least 1 hour. Using the same method as in Strawberry Greek Yogurt Banana Ice Cream, food-process the frozen bananas with a bit of Silk soymilk until the consistency of soft-serve ice cream. Process in the bananas and frozen raspberries until the raspberries are all broken up and the ice cream is pink. 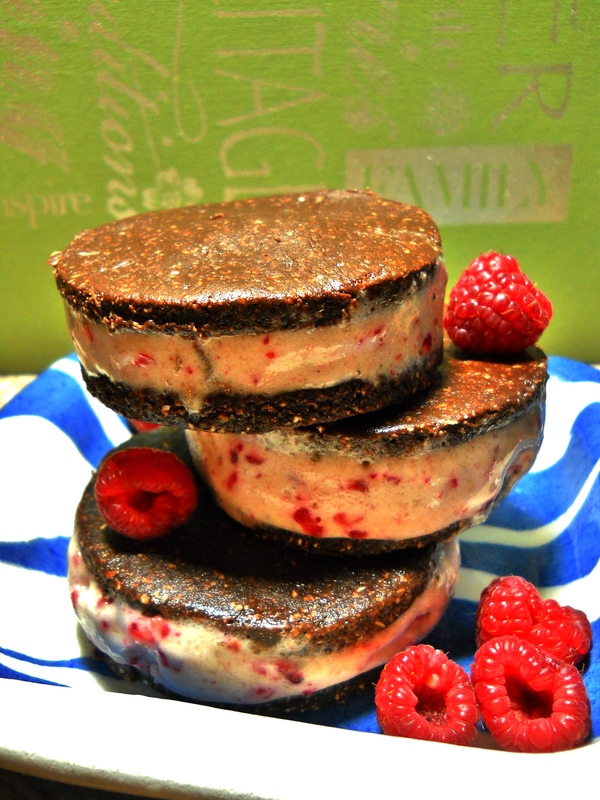 Using the cookie cutter, place a frozen cookie back inside, and then scoop some ice cream on top. Place the other half of the cookie on top, and carefully push it through the cutter. Ta da! 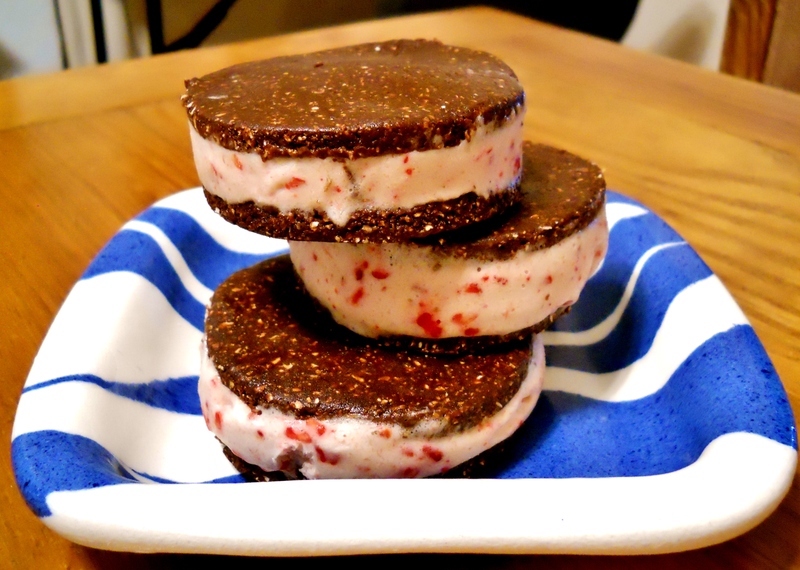 Ice cream sandwich. Put each in the freezer as you assemble the rest of the sandwiches, and allow to freeze for about an hour or so for optimal texture. I got 6 sandwiches, with leftover ice cream. If you roll the dough out more… you will get more sandwiches. This recipe is also vegan, easily made raw, and gluten-free (using gluten-free oats) for those of you interested.